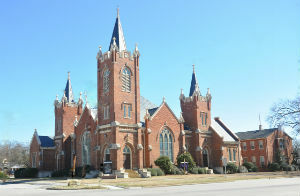 On behalf of our congregation, it is a pleasure to welcome you to Main Street United Methodist Church, a welcoming, disciplining, and serving community of faith in Dillon South Carolina since 1892. Our Lord Jesus Christ said, “Where two or three are gathered in my name, there I am among them”, and “If in my name you ask for anything I will do it.” These words are full of grace – and power. We desire in all our occasions of fellowship – worship and praise, church school, Bible study, children, youth and adult activities — to be together and work together in Jesus’ name and spirit. And in our outreach, we are energized by prayer-full direction and purpose. In all things we are affirmed when Jesus and the gospel are lifted up in all that we undertake. We are also partners with the Marion District in the Pee Dee region of South Carolina; and with the South Carolina Annual Conference, which serves all our UM congregations through twelve districts. We have reached our 100th year at this present location at 401 East Main Street, just two blocks from the city center of Dillon, the seat of Dillon County. We are pleased to be in a location that allows missional outreach in any direction. And we are able to welcome everyone from any direction! We are even easy to reach via Interstate 95: exit at the #190 interchange east into Dillon for two miles on Highway 34, which becomes Main Street. It will bring you right to us! Whether you are living close-by and looking for a faith-family to be a part of, or you are traveling and simply looking for a place to worship, we welcome you to Main Street United Methodist Church, Dillon, South Carolina.